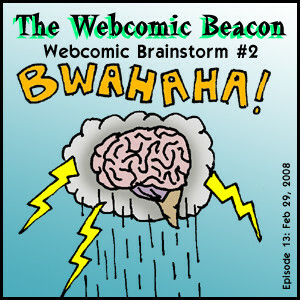 Continuing from where we left off in Episode 8, we present Part 2 of our Webcomic Brainstorm Sessions! On our panel we have Eric of Exiern, Thom of Crossworlds, and Gothia of American Gothic. Also, Aarin of The Best of What’s Left joins us as a Guest Host since Tanya is out again. Brett and Diana are also out this week, but we still have Aarin Edwards giving his Impressions of Camera Obscura and The Best Band in the Universe. 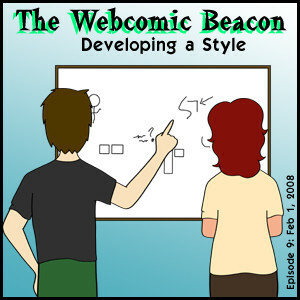 For next week, we will be having Michelle and James Lehmann of Family Webcomics on the show. We’ll be talking about All Ages Comics. Submit an audio file or plain text e-mail message to us with a question or comment about this week’s topic, or next week’s topic! But hey, maybe you should pick up our Feed! Notes: Sites mentioned this week: Anders Loves Maria, Rouges of Clwyd-Rhan, Galaxian, and 100-Strip Milestoners: Bristled and The Manual… who, ironically, have both gone on Hiatus. Special Guest Host this week! We have Jerzy Drozd of Sugary Serials and the Art and Story podcast! 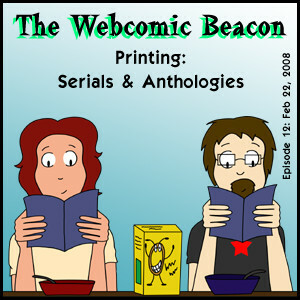 We talk about printing webcomics in issues, serials and anthologies. Plugging a number of sites in the process. We miss having Diana and Brett this week, but Fes goes ahead and reviews Marry Me. Also we still have Aarin Edwards giving his Impressions of Split Shift and Poly+Morfs. Notes: Sites mentioned this week: Sugary Serials, 01 Comics, IndyPlanet, KA-BLAM Digital Pritning, LuLu; and webcomics: Nemu Nemu, Dial K for Komics, Jenny Everywhere. Also enter contests at Strip Fight.org. 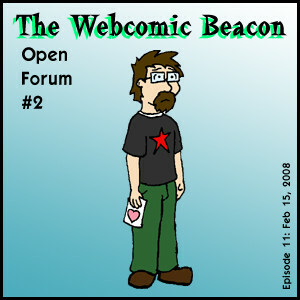 Webcomic Beacon #11: Open Forum Discussion #2, and Rene Engström Interview! The candy is 50% off, and we had another open forum for this week’s show! We maybe mentioned Valentine’s Day, but we also talked about The Nominees of the WCCAs (vote soon!). We also interviewed Rene Engström of Anders Loves Maria *NSFW*! Also Brett Hainley rants about online dickery in his Casually Ramblings. Diana Nock gives us a review of Hold My Life, and Aarin Edwards gives his Impression of Stupid Robot. Notes: Some other sites and webcomics mentioned on this week’s show include: The Best of What’s Left, Meiosis, Minus, Bear and Kitten, Cooties, Quitting Time, Coffee Time and Across the Way, Comixtalk.com, Comixpedia.com, and tons of comics listed as the nominees to The Web Cartoonists’ Choice Awards. (Vote Now!) And check out the ongoing comic strip contests at Strip Fight.org. 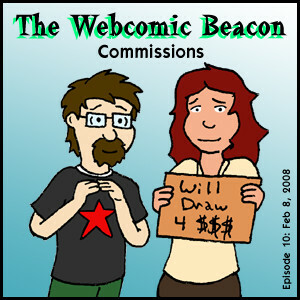 We are will be talking about Commissions as we interview Obsidian (aka O. Abnormal) of Commissioned Comic .com! Once again Brett Hainley delivers his thoughts with Casually Ramblings. Diana Nock gives us a review of Truck Bearing Kibble. And also Aarin Edwards with some Webcomic Impressions of Teddy Bear Trauma and Easy Skankin. What’s the difference between drawing in a style and not drawing well? We talk about developing a style and come up with a few different approaches. Brett Hainley Casually Rambles on the subject. Our Interview this week is with Brock Heasley of Super Fogeys! Again we have Aarin Edwards with honest Webcomic Impressions of Thick Pie and Calamities of Nature. No webcomic review this week. But a special Happy Birthday to The Mortician of Project A.D.A.M.! Happy Birthday Dude!